I smooshed (technical term!) Distress Ink pads onto a stencil, then misted the stencil lightly with water before plopping a piece of white cardstock on top. Supplies: Stamp – Stampin’ Up!, paper – Neenah Classic Crest Solar White, Stampin’ Up! 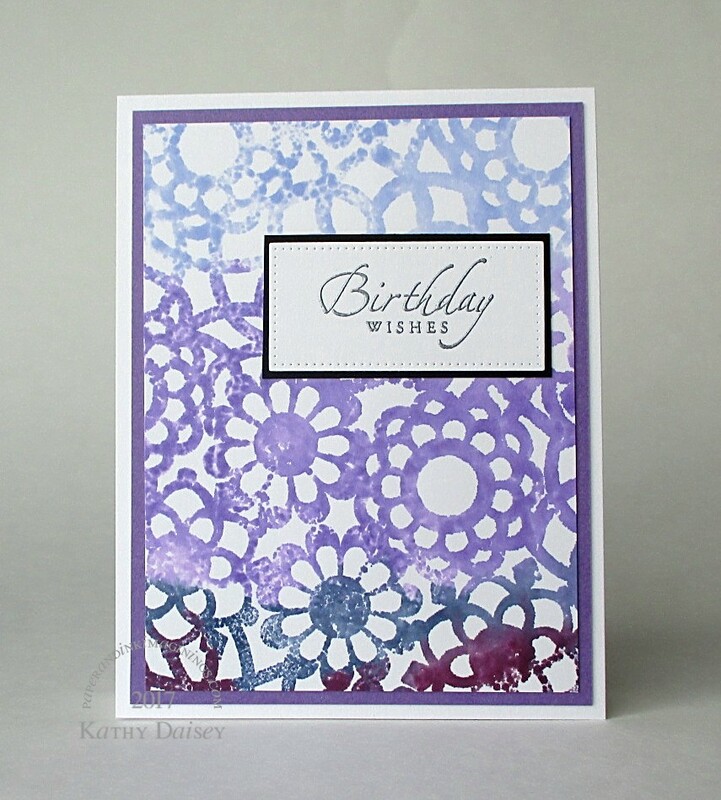 Basic Black, Taylored Expressions Grape Jelly, inks – Tim Holtz/Ranger Distress Inks Chipped Sapphire, Seedless Preserves, Shaded, Lilac, Wilted Violet, VersaFine Onyx Black, die – My Favorite Things, Stencil – Heidi Swapp, embossing powder – Ranger Silver Pearl. Categories: birthday, card | Tags: card, Heidi Swapp, My Favorite Things, Neenah, Ranger, Stampin' Up!, Taylored Expressions, Tim Holtz, Tsukineko, VersaFine | Permalink. Ooo, what a pretty card! It has a depth to it, which works perfectly. Thank you so much, Cobs! Have a wonderful weekend! This background looks very nice! I’ve seen this technique before, but haven’t tried it yet. Great card! Thanks, Regina. It is simple, give it a try!